While I have been turning small stuff for a while, I guess I never really took the time to write about it. My first introduction to turning was when I was a youngster. my cousin was turning bowls and vessels and he would let me monkey around with the lathe just turning small spindles for fun – I never really learned techniques, but just went along with it picking it up as I go. I like it. it’s super quiet, stable, it’s stout yet small frame. controls are easy to access, and arms and TS all move freely and lock well in place. the VS option is great when needed although I personally would have no problems using belts only to change speeds (even this VS model has belts which control ranges of speed where the VS can control the max and min speed within that range). all in all – I like it alot. 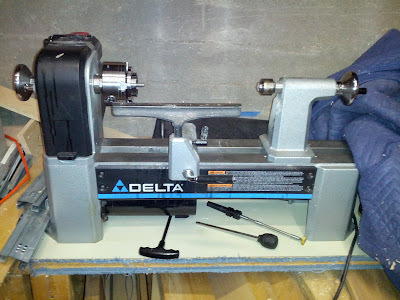 it did come with an extra long tool rest which is great for longer spindles/pens and the likes, but I would like to get a shorter one for when turning between centers or chuck+tailstock on shorter pieces where the longer toolrest won’t be able to reach the part… but no rush on that one. While researching for a chuck I found several decent options from the Novas, to the Baraccudas, and the Apprentice chuck as well. All somewhat within the same price range of $100-$200. anything above that was just not in my interest. but within this group I was interested in what will be the best performer, best kept value, and best longevity. The Nova3, Baraccuda, and Apprentice all share a similar price point and come with a wide selection of jaws to grab stock from small to large and seem to be the best bang for the buck. 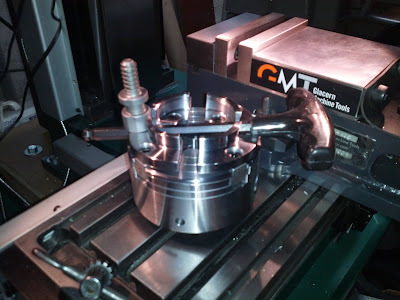 The Supernova comes at a higher price range and only comes with 1 jaw set – plus it requires an adapter to fit to the lathe spindle where the rest of the options are designed for the smaller lathes and come pre-threaded to mount directly on the spindles, this adds another part , and another cost to the supernova. the supernova and the apprentice both differ from the other chucks in that the scroll mechanism is completely enclosed in the body of the chuck whereas the other chucks have an open back. I didn’t care much for the open back both for the reason of dust collecting there (gears) and more so because I didn’t care much for the key that was used to engage the scroll mechanism (personal preference – nothing is functionally wrong with that design). unfortunately I could not find any contextual reviews on that Apprentice chuck, but what I could find suggested it is mediocre at best, and came with some hints that the machining process isn’t as good as it can get. While I like the ‘best bang for the buck’ idea of getting the most jaws for your chuck at a low price point, I personally prefer to get less jaws, and more chuck even if it cost a little more (again – price range is still close enough so that the extra cost isn’t extreme and out of reason). That in conjunction with the good reviews and the high tolerance machining (as claimed) of the Supernova got me to go that route. I ended up purchasing a reconditioned Supernova from Teknatools directly. with 1 set of jaws (50mm / 2”), a drive screw, enclosed scroll mechanism and an indexable chuck (not sure I’ll use it as the lathe itself has an indexing mechanism in the headstock) which were all standard, as well as an adapter to fit my spindle and shipping, it ended up costing less than any of the other alternatives – before shipping was included (some had free shipping though)- albeit without the extra sets of jaws. I will get the jaws I need as I need them – most likely the smaller jaws – or I might even make them (wood or metal) per required project. The chuck has a set screw which locks the insert in place, and there is mark on the insert where you can drill it out and tap to add another set screw to lock the insert to the spindle which I will do at some point as this lathe can turn in reverse and theoretically the chuck could come off – although for sanding purposes, this is very unlikely to happen if the chuck is mounted properly. The chuck seems to be holding stock pretty well. 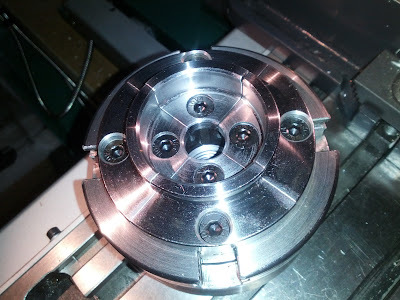 runs smoothly and doesn’t seem to overpower the lathe in both size and weight. next – I do want to turn some wooden adapters to be able to hold narrower stock with the stock 50mm jaws for turning smaller projects. 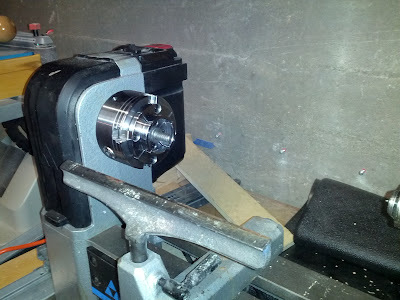 I have the same lathe and that chuck’s little brother. Both have served me well. I have just scratched the surface of turning, but like it. I, too, have the Delta 46-460 w/extension bed. I have two chucks … a PSI Economy (tommy bar), and a Delta/Nova G3 (open back). I bought the G3 because it is reversible, and find myself using it most of the time. So far, the open back hasn’t been a problem. I think turning is the most addictive form of woodworking – the results are immediate and very gratifying. Gerry – I don’t think there is anything wrong with the G3 (or any problem) -just a matter of personal preference. nothing more. FYI, as I mentioned, the Nova insert can be drilled and tapped with a set screw just like the reversible G3/delta chucks. 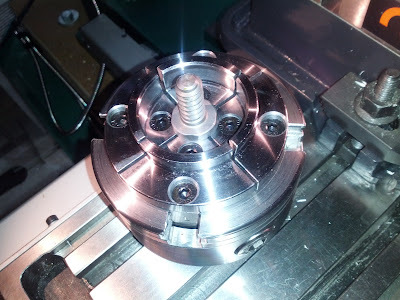 What I do like about the larger chuck is that while it does require you to also get an insert – it also makes it possible to move to other lathes, and probably for the same reason -easier to resell if the need ever arises. Not much to add here, I have the same lathe with a PSI chuck. I like it, but the Nova does seem nicer. It will be fun to see what you do with it. 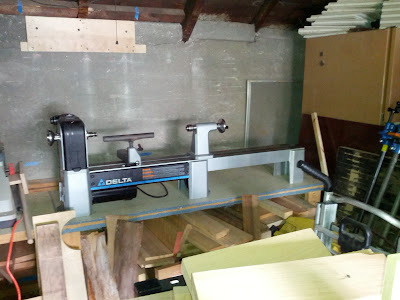 I remember seeing that lathe on CL… glad to see it got into good hands. I have a Jet 1220 that I got on said CL, and a Nova also. You probably already know this, but in case not… I found that it helped to have a washer to separate the chuck from the threading on the headstock, since it tightens as it spins. Sometimes it can be tricky to get off. A good washer can be had for zero dollars as long as you have a milk jug lying around. Cut into shape of washer and go to town. Great write up Purp. A good resource for anyone in the market for a chuck. Thanks for sharing.